To navigate to my Home Page click here. This is my fully steerable, elevation over azimuth mounted 3 meter parabolic dish antenna. It is currently set up with a prime focus feed which covers L-band in order to track the NOAA series of weather satellites. Here is a close-up of the Scientific Atlanta mount. Position is sensed with synchros on both axes. All of the drive electronics are out of the weather. 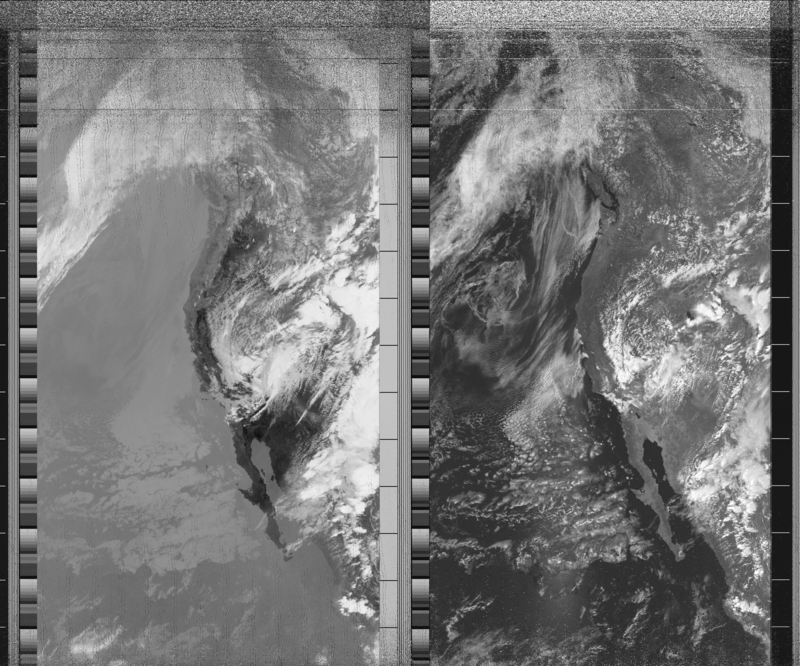 An image from NOAA-15 showing the left coast of North America. The image on the left is from an infra-red imager and the one on the right is from visible wavelengths. This picture was taken during the rainy season when west-to-east moving fronts breakdown the high pressure normally over this area during the summer months. During the spring, summer, and fall, storms move via the jet-stream north away from this area. I wrote the program which does the image processing in C++ operating on a PC. The signal in the 137 to 138 MHz band, is received on an FM receiver and demodulated to baseband audio. The satellite modulation is a 2400 Hz DSB AM signal representing the amplitude as a function of time. I feed the output of the receiver into the sound card on my PC and the program then buffers the signal out of real-time, demodulates, and processes it into the image shown. The system is just a fancy form of FAX transmission. This particular pass had an 86 degree max-elevation so my receiver location is almost in the center of the image both horizontally and vertically. On Low elevation passes I can see the Great Lakes if the pass is to the east, and I have seen Hawaii at very low elevations on westerly passes. A friend of mine, Dave "D16" Raimondi, has modified the original program to completely automate the process. He sets-up the passes he wants to record for the day, and his steerable Yagi automatically moves to track the satellite motion through its visible orbit path. There are several NOAAs still operational, and he can track them all.